Undoubtedly, it is "The Thinker". The Thinker (French: Le Penseur) is a bronze sculpture by Auguste Rodin, usually placed on a stone pedestal. The work shows a male figure of over life-size sitting on a rock with his chin resting on one hand as though deep in thought, and is often used as an image to represent philosophy. There are about 28 full size castings, in which the figure is about 186 centimetres (73 in) high, though not all were made during Rodin's lifetime and under his supervision, as well as various other versions, several in plaster, studies, and posthumous castings, in a range of sizes. Rodin first conceived the figure as part of another work in 1880, but the first of the familiar monumental bronze castings did not appear until 1904. Originally named The Poet (French: Le Poète), the Thinker was initially a figure in a large commission, begun in 1880, for a doorway surround called The Gates of Hell. Rodin based this on The Divine Comedy of Dante, and most of the many figures in the work represented the main characters in the epic poem. Some critics believe The Thinker, at the centre of the composition over the doorway and at about 70 cm high larger than most other figures, was originally intended to depict Dante at the gates of Hell, pondering his great poem. However, there are questionable aspects to this interpretation, including that the figure is naked, Dante is fully clothed throughout his poem, and that the figure, as used, in no way corresponds to Dante's effete figure. As Rodin wanted a heroic figure in the tradition of Michelangelo, to represent intellect as well as poetry, he created this work. 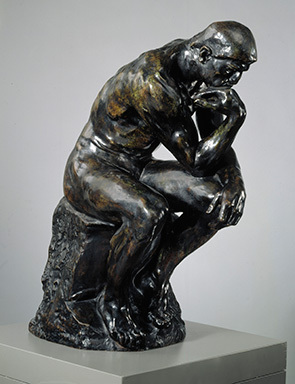 Auguste Rodin (1840-1917), "The Thinker", 1881-1882. Bronze 72 x 34,5 x 63 cm. Ateneum Art Museum. And why do I like this art work? Or why does anybody like any art work? Well, as a person of science I would like to put it in a scientific way. It has everything to do with neuro-aesthetics. What is it? Neuroesthetics (or neuroaesthetics) is a relatively recent sub-discipline of empirical aesthetics. Empirical aesthetics takes a scientific approach to the study of aesthetic perceptions of art and music. Neuroesthetics received its formal definition in 2002 as the scientific study of the neural bases for the contemplation and creation of a work of art. Neuroesthetics uses neuroscience to explain and understand the aesthetic experiences at the neurological level. While much of neuroaesthetics deals with the visual and perceptual processing of art, that's not where the field stops -- imaging studies are revealing a plethora of brain regions activated when we experience art. Not only are visual and perceptual processes involved, but also reward pathways and areas of the brain like the prefrontal cortex, which are involved in evaluative judgments. The prefrontal cortex's role in experiencing art isn't surprising -- it's involved in many aspects of higher-order cognition, like decision-making as well as planning and moderating complex behaviors. Regions of the prefrontal cortex have been implicated in both aesthetic judgments and the aesthetic emotional experience. Our response to art always has an element of appraisal that has to do not only with a work's visual properties, but also with the context it's presented in and our knowledge of its history. . Neuroaesthetics -- as evident from even its name -- often overlooks the fact that art does not have to be beautiful: context and history play a crucial role in our judgments. I have a great AFFINITY towards intellect. It gives me a high. Whenever, I see ''The Thinker", it rewards my brain! Why? Because the work denotes intelligence, logic, critical thinking, philosophy, literature, science, art, poetry and several other things I am associated with! In a way I am familiar with this type of intellectual pursuits. I can relate to it in a big way! I want to have one of the several versions of it in my home! This detail from the Gates of Hell was first named The Thinker by foundry workers, who noted its similarity to Michelangelo's statue of Lorenzo de Medici called "Il Penseroso" (The Thinker). Rodin decided to treat the figure as an independent work, at a larger size. The figure was designed to be seen from below, and is normally displayed on a fairly high plinth, though the heights chosen by the various owners for these vary considerably. About 28 monumental-sized bronze casts of the sculpture are in museums and public places. Rodin made the first small plaster version around 1880. The first large-scale bronze casting was finished in 1902 but not presented to the public until 1904. It became the property of the city of Paris — thanks to a subscription organized by Rodin admirers — and was put in front of the Panthéon in 1906. In 1922, it was moved to the Hôtel Biron, which had been transformed into the Rodin Museum. Details of the art work are taken from Wikipedia with other inputs from Sci-Art Lab. I am sure several people will get inspired by this work.